At first the Anglicans had no bishop in the Cape and had to rely for confirmations and other episcopal proceedings on the services of visiting bishops on their way to India. 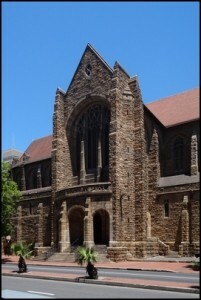 From 1807 until 1834, English services were held in the old Dutch Reformed Church; the small Anglican congregation had not been able to afford a church of its own. In 1827 the Bishop of Calcutta, on a visit to the Cape had asked the Acting-Governor for the grant of an acre of ground, and in 1829 an ordinance had given official sanction to building a church at the lower end of theCompay’s gardens. The design of the new church had been chosen from a set of drawings obtained from England. The choice had been the Church of St. Pancras in London, a building of classical beauty and dignity completed in 1822.